More Calls with 1/6 the Budget | SEO Services for Local, National and Global Businesses. Successful Auto Repair Shop in South Florida was having some success in driving customers through Google searches and looking to increase their exposure. After their FREE Site Evaluation a customized digital marketing plan was presented and launched. One part of their plan was a specialized paid search campaign. Within 30 days of launching their Call Targeted PPC campaign with Immersive SEO, we compared their results with that of their $3000 mailer. The chart represents the calls generated per $500 spent. 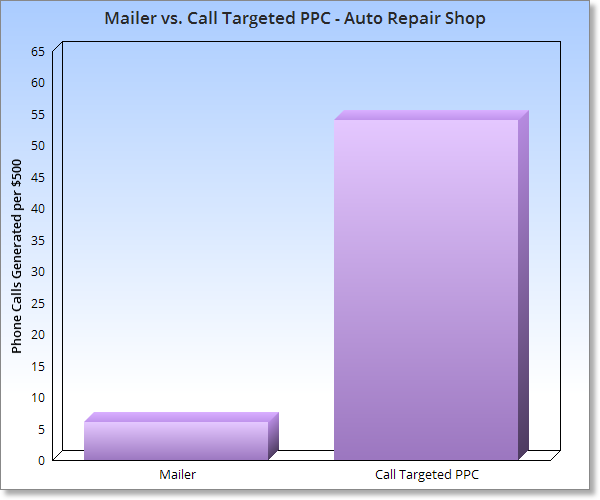 Not only did the number of calls massively out perform the mailer the shop saw 3 transmission repair jobs in the course of a couple weeks – the same amount they would normally do in an ENTIRE YEAR.